Dr. Kumar discusses how racism is as central to contemporary American imperialist policies now as it was when war was waged against North America’s original inhabitants. She explores historical encounters between Islam and the west, debunking the myth that these can be understood in terms of a “clash of civilizations”. 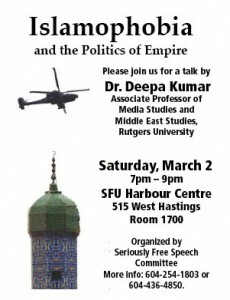 ORGANIZED BY Seriously Free Speech Committee. FINANCIALLY SUPPORTED BY the Hari Sharma Foundation; the Simon Fraser Public Interest Research Group; and the UBC Social Justice Committee. ENDORSED BY Afgans United for Justice; Boycott Israel Apartheid Committee; Canada Palestine Association; Canada Palestine Support Network; Critical Race and Postcolonial Feminist Theory Research Network; Independent Jewish Voices; International Socialists; Kwantlen University Critical Criminology Working Group; Siraat; South Asian Network for Secularism and Democracy (SANSAD); UBC Colour Connected; UBC Solidarity with Palestinian Human Rights Committee, Westcoast Sheen. This entry was posted in SFSC and tagged audio-video, SFSC Event Past. Bookmark the permalink.